Metropolis II by Chris Burden is a beautiful and complex modern art piece that poses interesting questions for conservation practice and future maintenance. I have heard that it costs in excess of $200,000 to operate per year and yet is not run on a daily basis. The cars alone require a considerable amount of care – as the wheel bearings wear out from regularly running at speeds of over 200 scale mph. Watch the video above to see it running! Situated in the center of the grid are three electrically powered conveyor belts, each studded with magnets at regular intervals. The magnets on the conveyor belt and those on the toy cars attract, enabling the cars to travel to the top of the sculpture without physical contact between the belt and cars. At the top, the cars are released one at a time and race down the roadways, weaving in and out of the structure, simulating rapid traffic and congestion. Metropolis II is on long-term loan to LACMA, thanks to the generosity of LACMA Trustee Nicolas Berggruen. Beginning January 14, 2012, the work will be on view on the first floor of the Broad Contemporary Art Museum (BCAM) and run on weekends during the scheduled times below. Taken from a press release from LACMA available here. 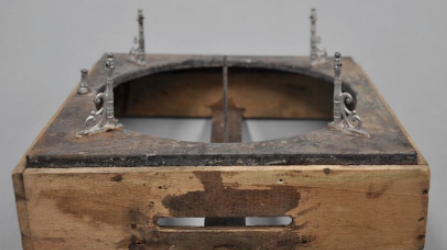 Restoration of a 19th c. lottery game by M.J & Cie. I put aside all of the unstuck and bathed papers to dry, and to flatten under a press. I also prepared a dampening room, consisting of a sort of tiny plastic tent (that you can close perfectly) and bowls filled with water. 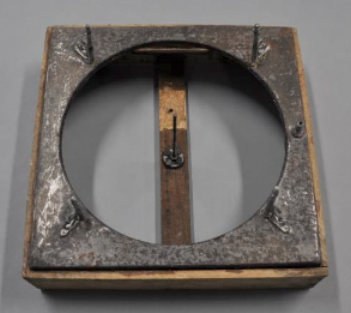 The cardboard lid was placed higher than the bowls, to avoid any risks of contact with liquid water. I then started to put some unheavy weights on the deformed sides. The idea is to progress gently. Everyday, I would add a little more weight, to flatten regularly the cardboard. When it would be flat enough, I could place a big weight to flatten definitely the side treated. This took me a few weeks, also because I had to treat each side individually, to have it horizontally (simple logic !). Meanwhile, I decided to treat the mechanics of the game. I first removed the green felt, that was not really green anymore, nor sticking, and almost “holing”. I then dismounted the game in order to put it right again in order to work. 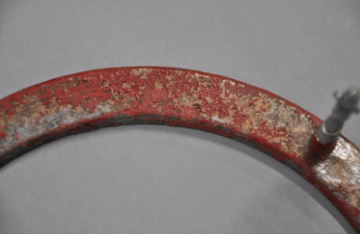 I gently sanded the pulverulent rust. For the red ring, I used Paraloïd B72, which is a thermoplastic resin, used especially in ceramics and metals restoration. It is stable in the passage of time. I first applied it everywhere between the flakes network with a tiny brush, to fill the holes, and when it was dry I applied a second layer in top of it all. 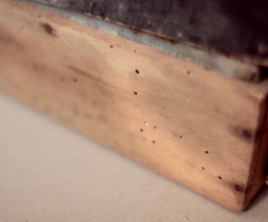 The insects holes of the wood were treated individually with a syringe and insecticidal. I could also have used anoxia, that I did not know at the time and avoids using toxic materials. It consists in killing insects by deprivation of air. You can do it at home ! 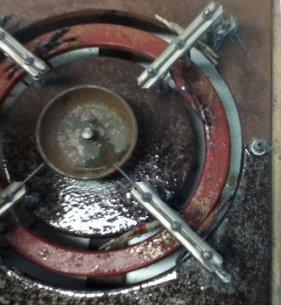 It consists in keeping the object contaminated in a plastic well sealed for at least 72 hours. Finally, I mounted all the parts again right at their places. The game was indeed working better. 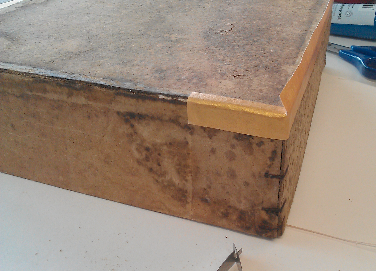 I closed the base with a non acid cardboard to replace the one that was contaminated by mold. I replaced the fabric with a new felt cloth, antique, but never used, and with unfaded color. It was a hard part. I had to cut it exactly to fit the original place, and to stuck the sides well between the wood and the metallic parts. Now that the papers were dry, it was time for mending. In fact, each side where separated from each other due to wear and tear, while they used to be just one long band wrapping the box. I also had to figure out how the flaps used to be, as some of them where missing. I torn some pieces of Japanese papers, to keep fibers on the side that will be stuck to the papers tears. This allows us to naturally extend the paper, as if it had never been torn. Cutting it perfectly would not offer a good adherence. Also, the fibers of the Japanese paper and of the ones of the object needs to be in the same direction to offer a perfect tension. I chose a Japanese paper that would approach the basis weight of my object papers. I stuck these papers with wheat starch glue, on about 0,1 in, and put it under weights. The white parts where painted with acrylic in order to match with the rest, but in a color slightly different to make the restoration appear. I then prepared like-sized strips of Japanese papers that I painted with golden acrylic. 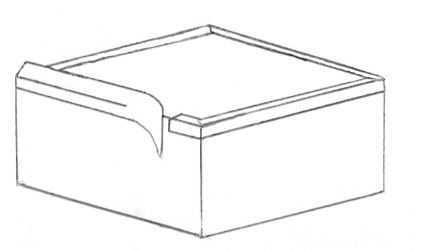 This is a sketch of the cardboard lid. As a wooden “T-bar” was missing (first arrow on the picture above), I replaced it with a non-acid piece of cardboard, before remounting the papers. I did an “in situ” retouch on the golden papers to tarnish them a little. Then, I re-stuck all the pieces of papers again. Oh no I will make you wait a little longer for the final picture. Exactly a year after my first post on this game ! Boy, it’s been a rough journey. I can’t believe all of the things that happened meanwhile !